I always need new ideas on what to eat so I thought this would be a great place to share pics and ideas for food that we have eaten this thread is for anyone to post on ! Any type of food can be shown off, breakfast, snack, lunch, tea, a tasty drink! Wether its home made or from a packet doesn't matter. If you see something you like, ask for a recipe! todays lunch was a Double-Double from In-n-Out, and a side of Animal Fries. my favorite food everrr, although definitely not the healthiest haha. I didn't make it, (or take the pictures btw) but I've tried to replicate animal fries at home and it just isn't the same. 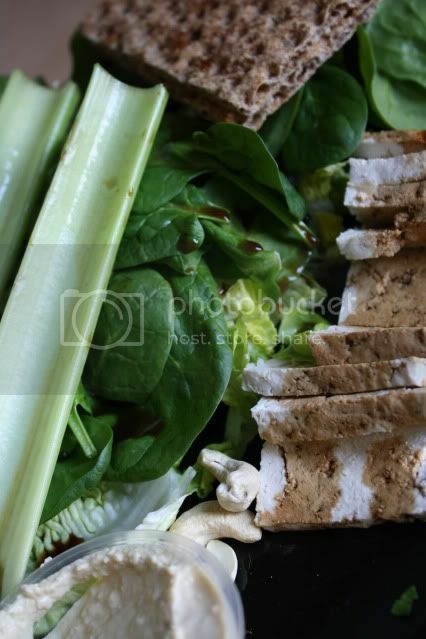 Spinach and iceberg salad with soy 'marinated' tofu, cashews, hummus, ryvita and celery. Omnomnom. marshy wrote: todays lunch was a Double-Double from In-n-Out, and a side of Animal Fries. my favorite food everrr, although definitely not the healthiest haha. I didn't make it, (or take the pictures btw) but I've tried to replicate animal fries at home and it just isn't the same. 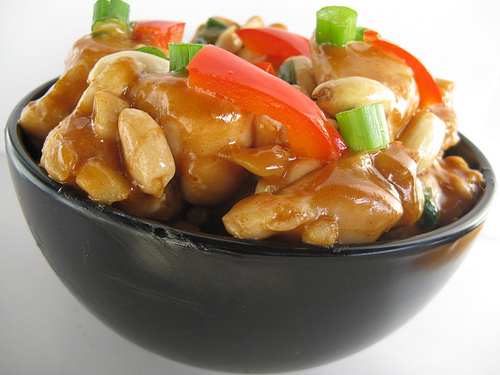 Not my image, but satay chicken, or better known as peanut butter chicken, hehe. Yum. Nachos are so friggin good. I've been watching what I'm eating and counting calories and whatnot, but I broke down and got hummus and falafel from Hoomoos Asli in NYC. Seriously, my FAVORITE dish in the entire city, and definitely my favorite hummus/falafel place!!! I scarfed down half of it before I stopped to take a picture. I was just like a shark--my eyes rolled back in my head and I stuffed it all in my mouth XD hehe. Jumping on the nacho bandwagon! I used mozzerella and a bit of garlic salt because I didn't have traditional nacho ingredients on hand. Party potatoes! They're just potatoes with sour cream, chives, and red onions on top, but I thought they looked pretty so I snapped a picture They were for my fiance's birthday on Saturday. ikickshins wrote: Party potatoes! They're just potatoes with sour cream, chives, and red onions on top, but I thought they looked pretty so I snapped a picture They were for my fiance's birthday on Saturday. today I was particularly impressed with the scale of jacket potato from the potato van conveniently positioned less than five minutes walk from my house, so I decided it warranted a picture. 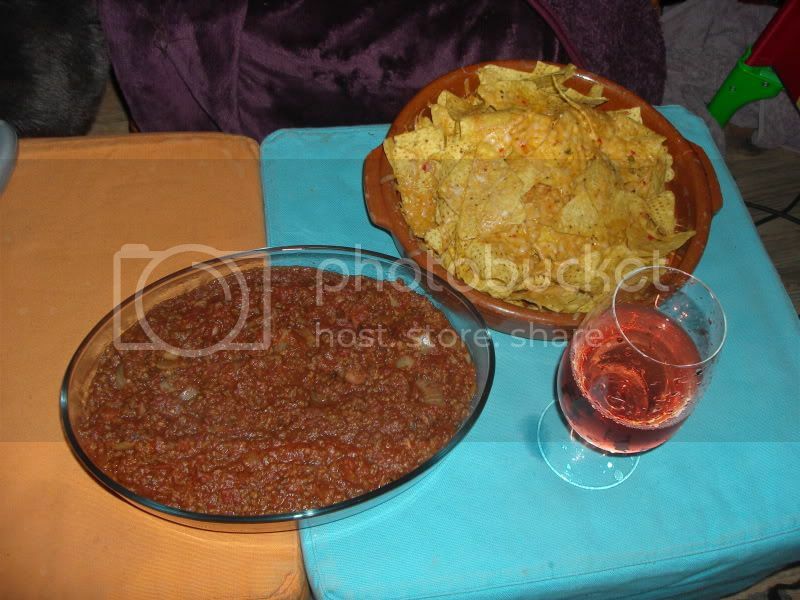 Jacket potato with cheese and beans. Nom. 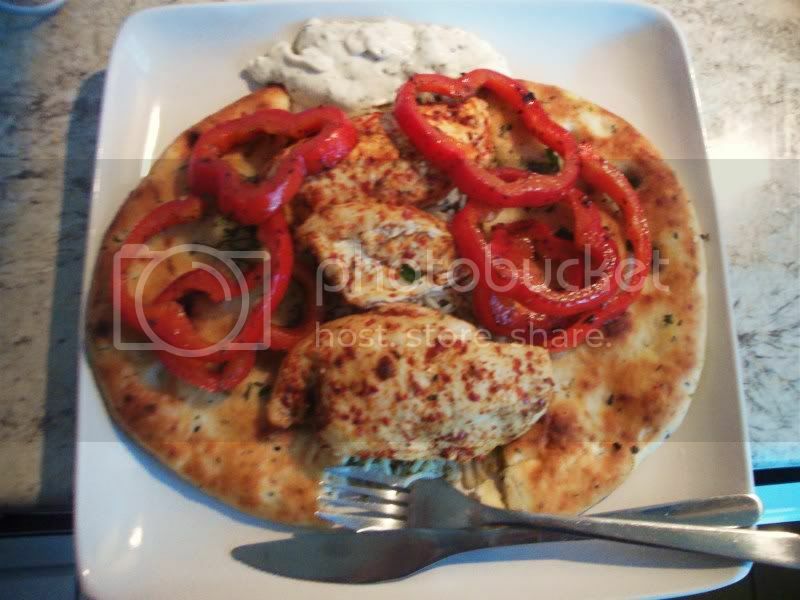 It iss.... Tandori marinated chicken style fillets with shallow fried red pepper in spices, served on nann bread and corriander rice and a raita dip !